There is no doubt that stripes are everywhere (in fashion, of course). Even at the most recent Spring '15 shows, stripes were apparent everywhere from Tibi's casual separates to Altuzarra's shirt dresses. Today I'm joining my gorgeous blogger friend Charmaine of My Infinite Fashion Confession to show you two ways to style stripes, either with subtlety or as a statement. Either way, the stripes make the outfit! For those who may be hesitant to wear statement stripes, I've styled the print in a more subtle way that still adds character to the entire look. It's been said that horizontal stripes make the body look wider, but I would disagree in the case of a skinnier print. Especially in the form of a fitted crop top, these skinny stripes are actually flattering when styled accordingly. Here I've created a look that is suitable for a dinner or night out with friends. 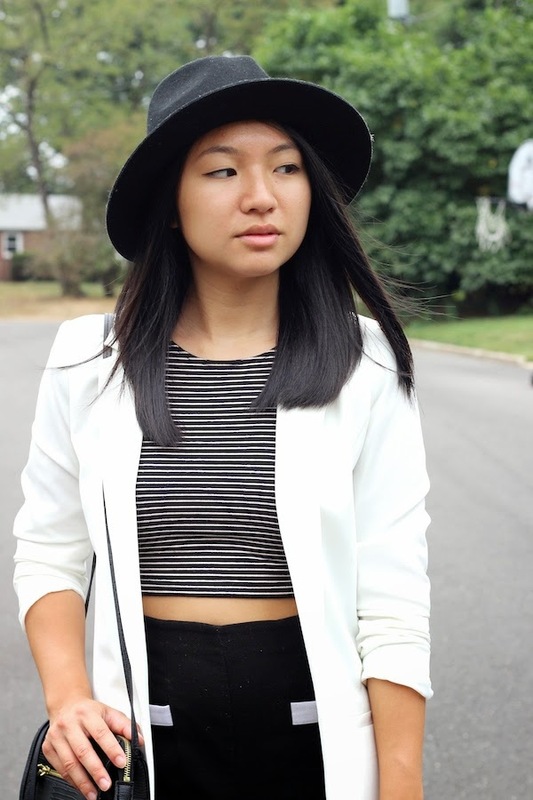 The oversized blazer juxtaposes nicely with the crop top and shorts to create a classy, but fun, look. For the brave fashionistas who love making a statement, Charmaine's high waisted pants are the perfect wardrobe addition. Though these pants may seem overwhelming, the thick vertical stripes elongate the legs instantly. For a petite girl like me, this is gold. By styling the pants with simple black pieces, she ensures that they are not too overpowering. It is comfort and class in one outfit. Who could ask for more? Let me know in the comments below which outfit you would wear! 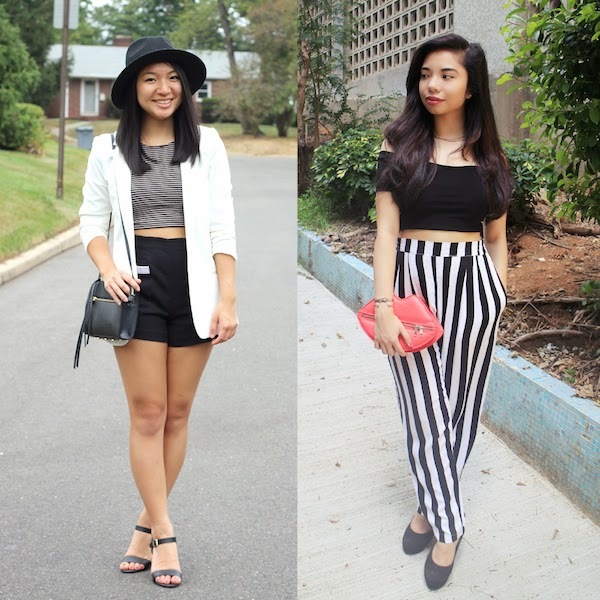 Don't forget to check out Charmaine's blog here for more style inspiration.Talk to you again soon! Love both outfit, you look fabulous as usual, i love the hat too. Love both of your outfits! I can definitely see myself wearing both of them. You two look so great! Have a lovely week ahead of you, Christina! You're so sweet Diane! Thank you! You are forever gorgeous, Christina:D I love how you styled your outfit. Thanks Gabby! Look at H&M!! Both looks are FAB! Love how you styled the stripes. You go girl!